Friends, Romans, Country Men Chimps, Gorillas, Orangutans, lend me your ears. I come to praise Caesar, not bury him… I’m sorry, that’s wrong. Not just because it plagiarizes Shakespeare, but because Rise of the Planet of the Apes has a purposeful aversion to the“human see, human do” sociopolitical commentary so prominent in Franklin J Schaffer’s allegoric 1968 science fiction classic. Resuscitating a seemingly exhausted franchise, this reworking of the 5th sequel/prequel in the original series, Conquest for the Planet of the Apes chooses a more cautionary, nature versus nurture, man playing god, scientific approach to the subject’s potentially hazardous legacy. Opening in the wild jungles of Africa, a shrewdness of apes frantically try to escape human hunters out to snare them for scientific experiments. Captured, caged and carted the most personable, named Bright Eyes (the first of numerous nods to its evolutionary cinematic link) arrives in present day San Francisco in the lab of geneticist Will Rodman (James Franco). A young, gifted engineer, Rodman’s singular goal is a breakthrough cure for his ailing father’s (John Lithgow) Alzheimer’s. 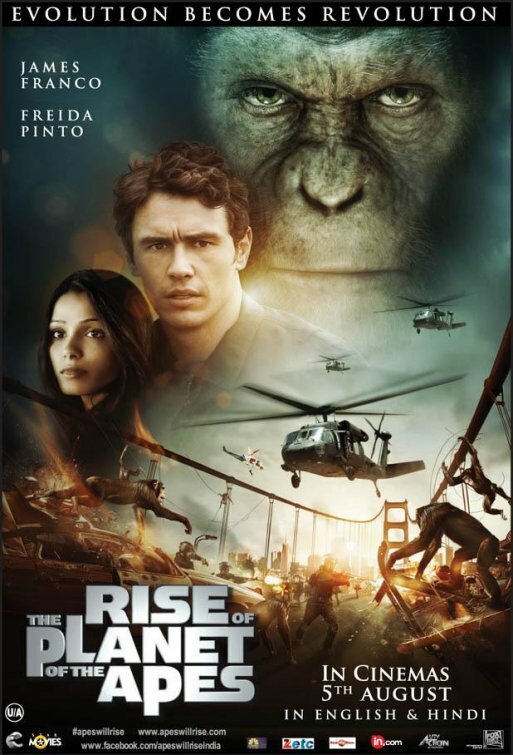 Unaware that she is pregnant, testing his new formula ALZ-112 on Bright Eyes leads to tragedy and it’s only through covert tactics that the advanced chimp’s offspring is rescued from execution. Smuggled back to Will’s home, the infant Caesar soon bonds with the father and son. Evolving quickly over the years he develops the ability to communicate through sign, process complex problems and even form conclusions from his own experiences. As self awareness dawns, a moment of instinctual, protective behavior has Caesar ripped from the nurturing environment he has known his whole life and thrust into a cage. Isolated from humans in a population of his own species for the first time. Kindness is replaced by primal force, the elements of revolution reveal themselves and the inevitable war for the fate of mankind will one day lead to a beach, a statue and a curse word. Far cooler than it deserves to be, the genesis (gen-sys) of the simian apocalypse entertains with Rupert Wyatt’s(The Escapists) resilient direction capturing the tender savagery of predatory hierarchies. 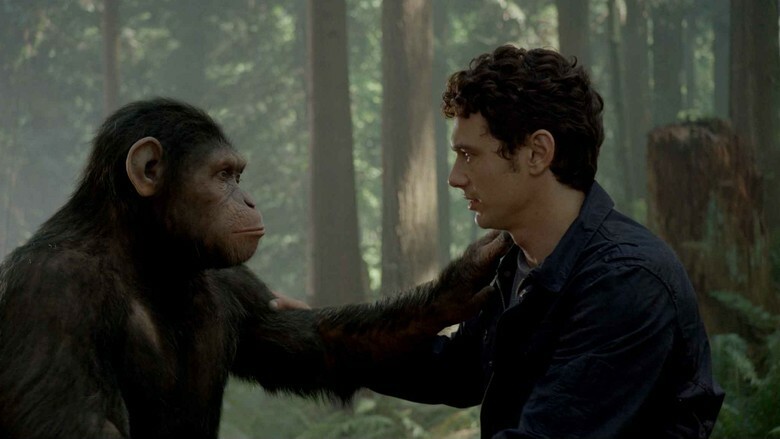 The focused writing and seamless FX blend rather than pop forging an emotional connection with alpha chimp Caesar that goes a long way to justifying this new films existence. This dimension adds gravitas to the pivotal action set pieces, elevating suspense and heightening the anticipation of the inevitable clash between the primates of Darwin’s evolutionary chart. Determined to make us cheer every Chimp-An-A to Chimp-An-Z, the well timed editing, framed staging and taunting pace builds excitement. George Lucas once quipped that eliciting an emotional reaction from an audience was simple (paraphrasing), “all you had to do was show an image of someone choking a puppy dog”. That’s very much true of this films first half. The chimp as anthropomorphized victim of oppression is impossible to resist. It’s a manipulative tool but the story continually toys with our curiosity and pays off in tasty enough morsels that as a whole the experience satisfies. The first 15 minutes of the running time seem jarring like they have removed massive chunks of the script. Fortunately the speedy introduction gives the audience credit and provides all the valuable information in a cinematic short hand that forces the hand out of the bag of popcorn. By the time we begin the body of the text goodwill has already been established. Amanda Silver & Rick Jaffa’s (The Relic) screenplay tracks Caesar’s getting of wisdom. His gaining of self knowledge unrushed much like in the first film where Taylor was given time to explore his surroundings. Respect for Rod Serling’s (Twilight Zone) original script is displayed with some glaring but witty reversals of dialogue that work in context. There are also nods to Pierre Boulle’s (Bridge on the River Kwai) novel in tone and scenery. Jerry Goldsmith’s original scoring is occasionally hinted at by the music of composer Patrick Doyle’s (Donnie Brasco, Carlito’s Way, Dead Again). Hiding in the background until needed, then bolstering impending tensions with the necessary air of fatalistic doom or simian-centric optimism. Aussie cinematographer Andrew Lesnie’s experiences working with Peter Jackson on the Lord of the Rings trilogy and King Kong mean the camera gives us excellent coverage with very capable framing and movement. This doesn’t just go for the action scenes but also the occasionally intimate moments of drama between man and tree dweller. Making sure to adhere to the principals it dictates in the set up, there are still flaws.James Franco’s, (Howl, 127 Hours) Will Rodman is the only human given anything beyond archetype. Even so, Franco still plays it more low energy for much of the first act, which may have been intentional to let WETA’s creation dominate the audience with telling eyes. It’s no surprise that John Lithgow (Raising Cain, Dexter) fills in the gaping clichés of his own role with touching empathy. His struggles with the disease expressed through the father’s touching relationship with Caesar. No one suffers from lack of character development more than Frieda Pinto (You Will Meet a Tall Dark Stranger). Essentially she’s the token female showing up long enough to coax slight emotional growth out of Will and also define his sexuality. Brian Cox (Manhunter, Adaptation) too as John Landon seems undefined. There is an unnecessary moral ambiguity to the part that even someone of Cox’s considerable talents can’t translate through unscripted mannerisms alone. Named for the 2 astronauts that accompany Taylor in the original film, Tom Felton plays Dodge Landron. The closest thing to a villain in the film he serves as sadistic jailer, taunting his prisoners with the same glee he does one bespectacled wizard. Varied characterizations aside, it would be a mistake not to acknowledge the seamless animal pantomime of go-to performance capture guy Andy Serkis (Kong, Gollum). Assisted by state of the art WETA technology surrendering disbelief to Serkis furry, emotive creation is simple. As astonishing as the man in a monkey suit make-up effects were in the 1968 film, the CG is so convincing you forget its presence for the most part. A lifetime fan of the films and original novel, possibly more forgiving than some, for JD this Apes film left him pounding his chest in unison. As the first chapter in a timeline reinvention it works similarly to JJ Abrams Star Trek reboot. 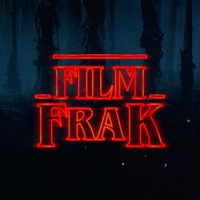 A satisfying launch pad that could lead to a wider story…..and the clever, concise closing credits promise much.